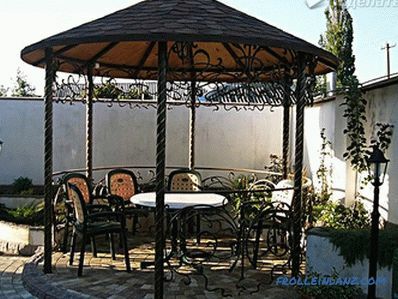 The metal gazebo is a durable and reliable construction, which, provided it is properly arranged, designed and planned, will be an excellent addition to the suburban area. 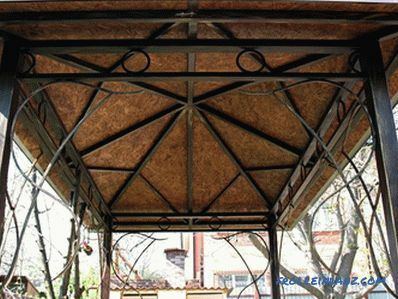 Today, a large number of types and shapes of metal arbor structures have been developed. 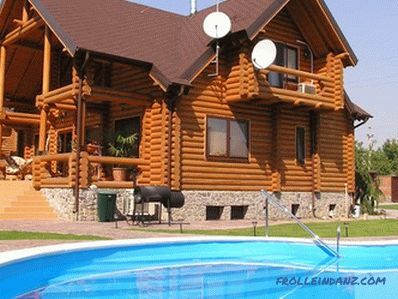 Therefore, to find a suitable option for you will not be problematic. 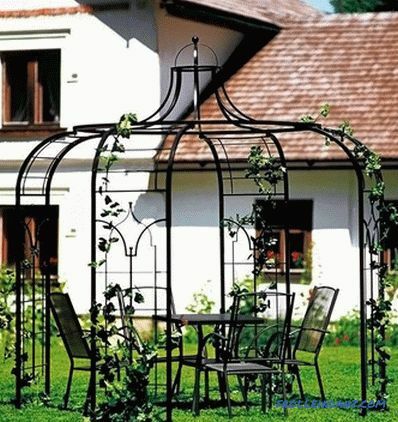 Although the market offers ready-made arbor designs, remember that making a metal gazebo with your own hands will not only save your family budget, but also enjoy the fruits of your hands. 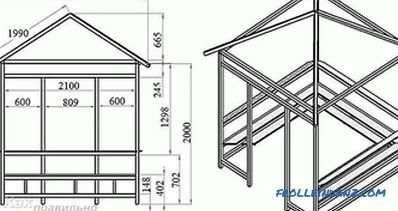 We suggest you to study the guide to the construction of the arbor. The pipes are concreted into the ground. After the concrete hardens, the whole construction of the arbor is welded to the posts. At some distance from the ground, the lower strapping is made, on which the flooring is laid. It is also possible to lay paving slabs on the base or to concrete the site. 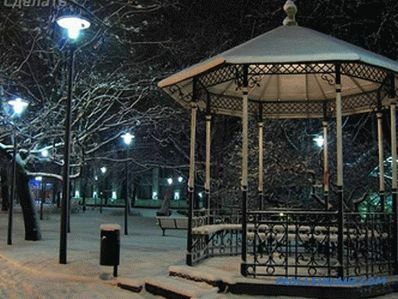 For such an arbor does not need a foundation. A shallow-tape or column foundation is being made. Himself arbor frame is made separately. It is installed on the already finished foundation and secured with anchors. Which of these technologies is more practical? If we talk about the reliability and quality of fastening, then the first option is more practical, since the posts are securely fixed in concrete, and this option is also cheaper. There is no need to make the foundation. But, on the other hand, this option is more suitable only for the summer period. 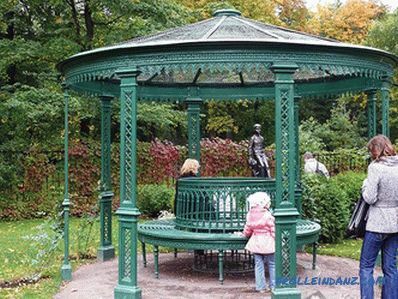 Without the floor in the winter can not do, so the second option is better, since it is possible to build a closed metal gazebo. Mostly metal products are assembled by welding. This installation method is reliable and fast. 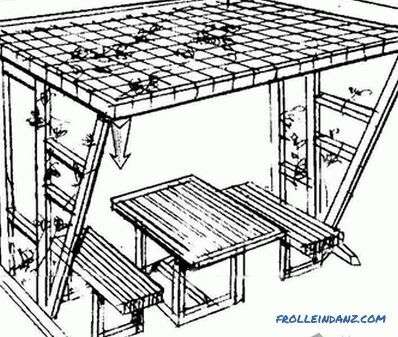 However, if you need to build a collapsible gazebo, its individual modules are connected with bolts. 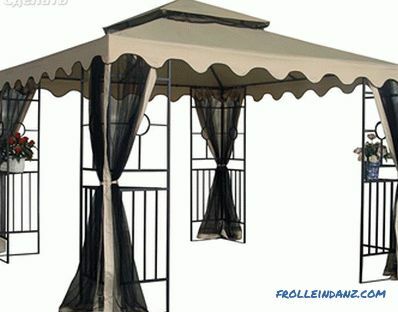 Usually such arbors are covered with an awning or a light roof is made. All elements of the structure - railings, roofing and risers are assembled very quickly. 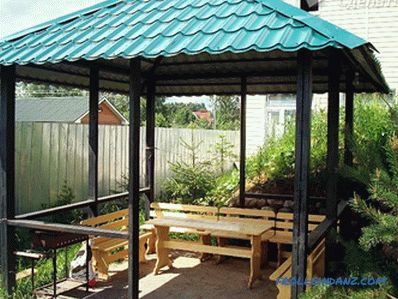 The advantage of such an arbor is that it does not require much space for its storage. 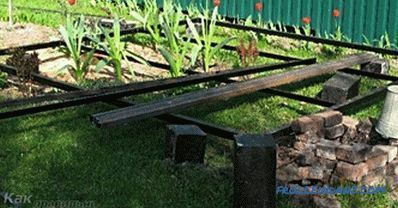 In most cases, metal arbors are made of shaped tube. 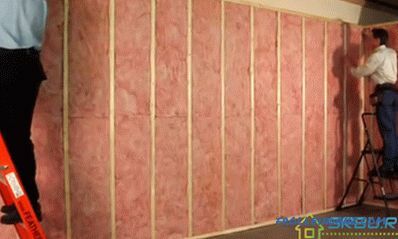 The thickness of its wall should not be less than 2 mm, but not too thick. If you plan to use round pipes, the wall should be similar to the pipe. In contrast to the profile, round pipes are cheaper. 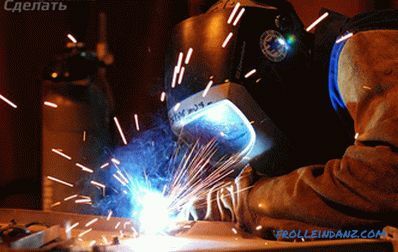 But when working with them, skills are required, since a sufficiently high qualification of the welder is required to weld round pipes with a beautiful and durable seam. 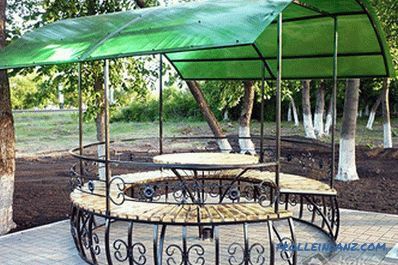 Although steel pipes are mainly used, it is often, especially for collapsible arbor structures, aluminum profiles are used. 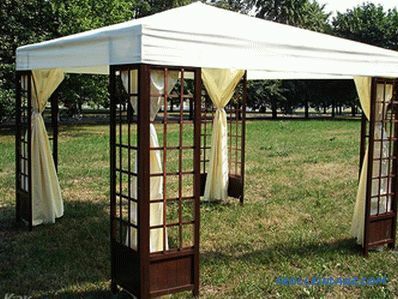 As a result, the gazebo will turn out much easier, but at a cost more expensive. 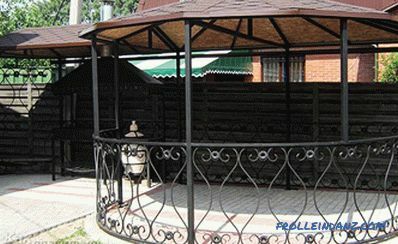 We suggest that you familiarize yourself with the process of manufacturing a metal gazebo from a shaped tube. 75 * 75 mm if the roof is laid tile or slate. For jumpers, a thinner profile is possible: 50 * 50 mm - maximum, minimum - 20 * 30 mm. 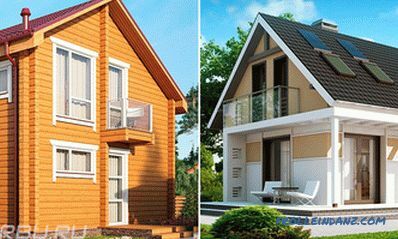 If you plan to build a large arbor, then, accordingly, the cross section of the profile is better to take a larger one and vice versa. Also consider the weight of the material that will be sheathed arbor frame. 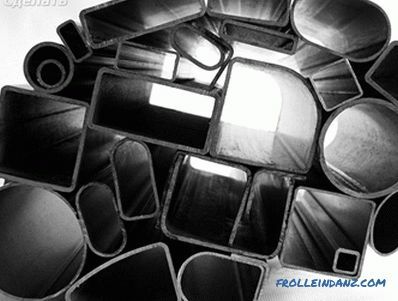 The profile tube for lintels in this name: 30 m - 40 * 20 * 2 mm, 6 m - 20 * 20 * 2 mm and 14 m - 40 * 40 * 2 mm. metal strips of 2 m 20 * 4 mm. You remove the fertile soil layer at the construction site. If water leaves the site well, then the pit is filled with sand and soil, preferably without vegetation. If the soil is predominantly clay, then clay is also filled in to be removed. 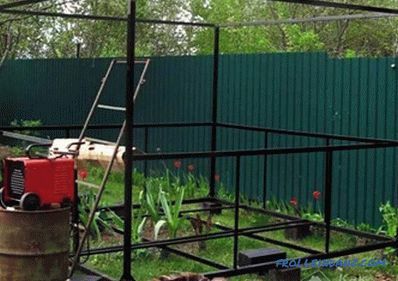 Next, a pit is made for installation of pipes up to 90 cm deep. You install a pipe in it, fill it with rubble of large fraction or construction debris. After that align the support pillars vertically. In an equal position, they should be fixed and then proceed to concreting. 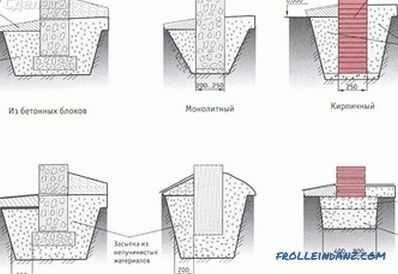 If M400 cement is used for concreting, then sand is added in the measurement of 3-4 parts. At the same time, the concrete must be liquid in order to fill the entire pit covered with rubble. For working with metal it is very convenient to use a level or plumb with a magnet . You set the measurement object in the right place and without any problems expose the support column by level. 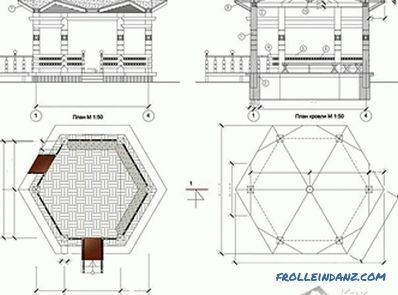 Another way to manufacture the foundation is to install the blocks on which the gazebo will be installed. With this performance, the structure will be raised from the ground level. The blocks are installed necessarily in the corners and in a staggered manner in the middle. This will prevent the pipe from sagging. When the edge of 50 mm 3 m pipe without support sags. 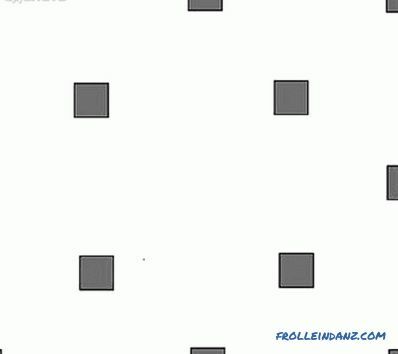 Blocks are aligned horizontally. To do this, in the corners, you can drive in pegs and pull a string between them. All this trouble with the installation of supports can be avoided if you just concrete the columns of the support into the ground. But in this case, the lower strapping will need to be welded to level. When the blocks are installed, suitable pipes are laid around the perimeter. For the bottom strapping is enough pipe 50 * 50 mm, but can be more. Be sure to check the horizontal level of the pipes. In the corners of the pipe weld. 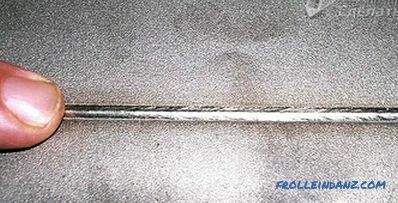 After that, to install the floor of the boards, weld jumpers from the pipe section of 40 * 20 mm. All pipes should be coated with a primer. Treat the welding points especially carefully. 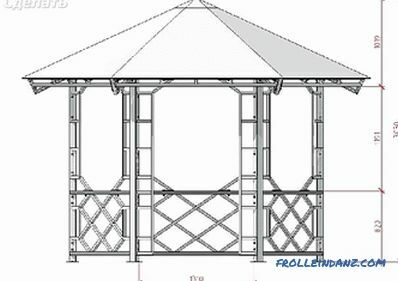 In order to be able to stand upright in full height in the gazebo, the stands are made with a height of 2200 mm. 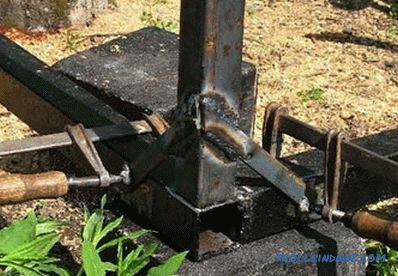 In order for the racks to have the necessary rigidity and to stand securely, you should weld the mounting brackets from a metal strip, as shown in the illustration. With the rack level, clamps clamp the bars and weld them with welding. Also scald the pipe at the base. In our arbor, the height of the railing will be equal to 900 mm. 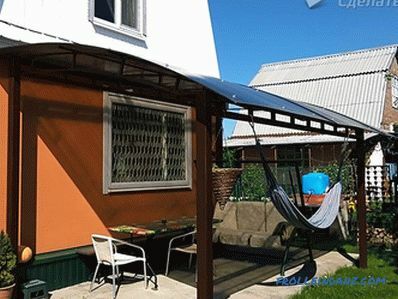 You can make the design without railings - it does not matter, for example, solid sew of polycarbonate. For the middle strapping (for the railing) and the top, a pipe with a section of 40 * 20 mm is used. So that the stiffness between the bottom strapping and the railing was sufficient, you can weld up the vertical supports of 950 mm from the same pipe. 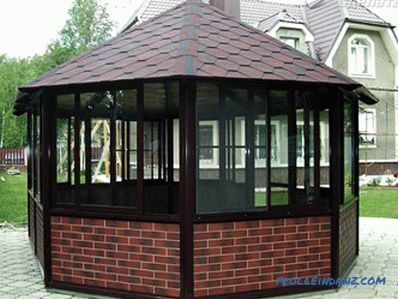 In our case, the roof of the gazebo will be covered with shingles. 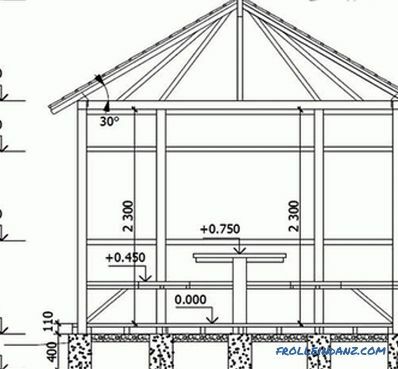 For this, the truss construction is made of wood. For the frame used bar 75 * 40 mm. To batten under the tile, you can use the wall paneling. For a more presentable view from the bottom, the paneling can be replaced with moisture-resistant plywood. At the open end of a shaped tube on the rack, hammer in a piece of wood not less than 100 mm deep. On top of it should remain a length of up to 70 mm. To these traffic jams will be carried out rafters. Therefore, traffic jams can be cut at the root and at the desired angle. Another option for attaching rafters is to weld a support of a metal corner at a given angle of a roof to the posts. At the corner a hole is drilled through which the truss system will be fixed. Rafters are cut in the amount of 4 pcs. 2.5 m. All the rafters are connected at one point above. They can be knocked down with nails or screws. At the same time, trace around the corner; for this, the ends of the timber are cut to the corner. 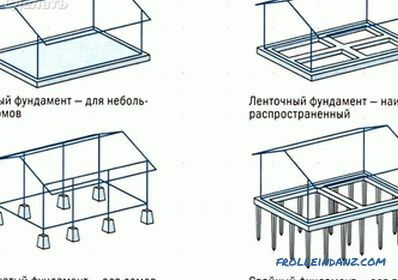 For better reliability, the rafters can be connected to each other with a stainless angle. Before installing the rafters, treat them with an antiseptic against rotting. They can also be treated with stain and varnish or paint in any color. 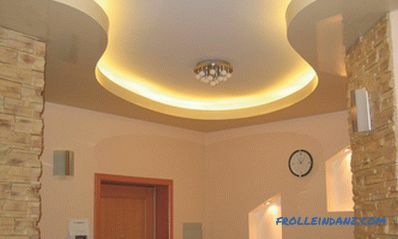 This will greatly simplify the work, since it will not be necessary to do all this at a height. Fix the cross-bar in the center of the upper trim. 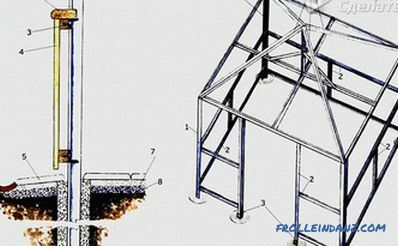 From him perpendicularly install the rack towards the upper trusses of the trusses. 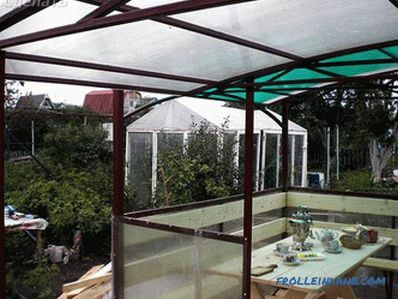 This will significantly enhance the design of the roof. 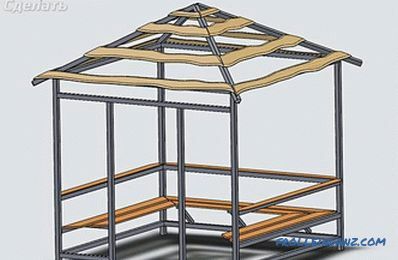 After installing and fixing the rafters, you can make a crate, and plywood or lining is laid on top. The final touch in the arrangement of the roof will be the laying of shingles. Her laying is done from the bottom up, and nailed with small nails. 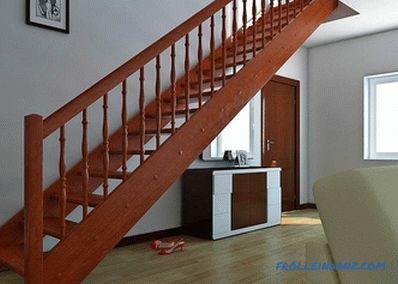 At the last stage, the flooring is made of 70 * 40 mm board. Small gaps are needed between the board, which will allow the wood to swell with changes in humidity. Given this, the floorboard is not recommended for flooring in the gazebo. 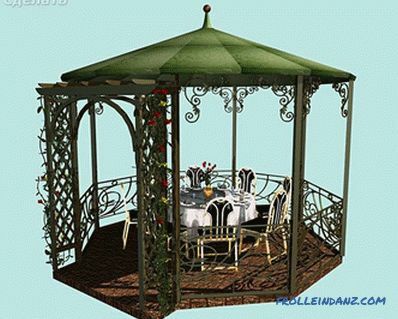 As for the sides of the gazebo, for its decoration, you can use a variety of options. 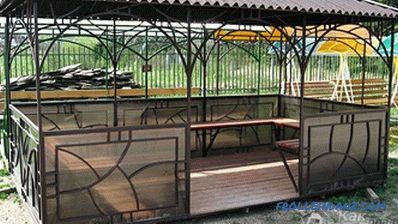 For example, weld forging elements, close the railing with polycarbonate, etc. 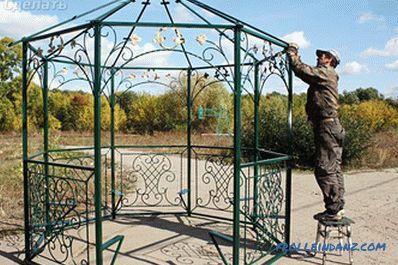 So, we learned how to make a gazebo out of metal using a shaped pipe. If you have your own experience in performing such works, then leave comments at the end of this article. 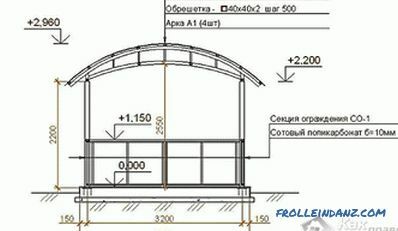 Also the drawings provided can help you.Starting from them, you can design your arbor of metal.